One of my favorite Sunday outings is to the funky Baltimore neighborhood of Hampden. The stores are filled with a mix of kitschy furniture, clothing, and art. The streets are where hipster meets blue collar, and I imagine there to be more tattoos per capita than anywhere else in the country. There is also an interesting array of restaurants, although if you are looking to shop and then dine, it’s important to note that many of the stores close around 5:00 pm. 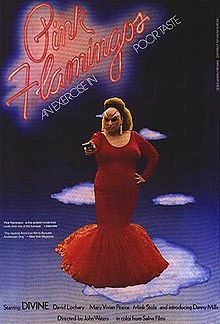 Hampden received perhaps its most prominent nationwide exposure in 1999, when Baltimore native John Waters filmed his movie Pecker there. Starring Hollywood actors like Edward Furlong, Christina Ricci, Martha Plimpton, and Lili Taylor, the film depicted a very elaborate & fictional view of Hampden and a young Hampden resident’s dream to escape it. We are here to dine at the recently opened The Food Market. Our friends have been here a few times already, due to a connection to someone involved with the restaurant. I’m eager to try the “approachable, serious comfort food” prepared by Chef Chad Gauss. Gauss has a ready-made following. based on his runs at other area establishments including recognition by Baltimore Magazine in 2010 as “Best New Chef” for his work at City Cafe. I’ve done a fair amount of homework about the restaurant, which has replaced a grocery store, hence the name. Online reviews consistently compliment the food, but there are multiple comments about the excessive noise level. 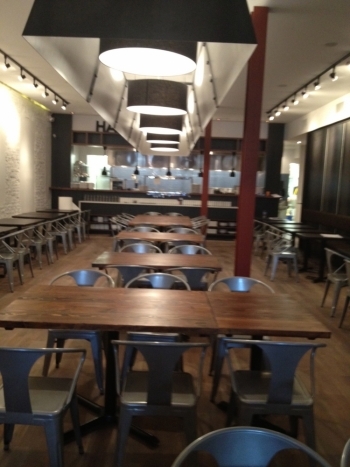 This is a hard to avoid result of an industrial decor featuring hard surfaces throughout. Efforts have been made to address the issue and I’m looking forward to hearing what our friends think about the difference. Literally. The menu is organized in sections: little, small, big, and in between. The littles are an easy decision for us: blue kernel popcorn and buffalo pickles. They are perfect bites to accompany cocktails that shine. I have “Delicious Grapefruit Sangria” which is a blend of wine, orange juice, lemon and lime juice, and campari. 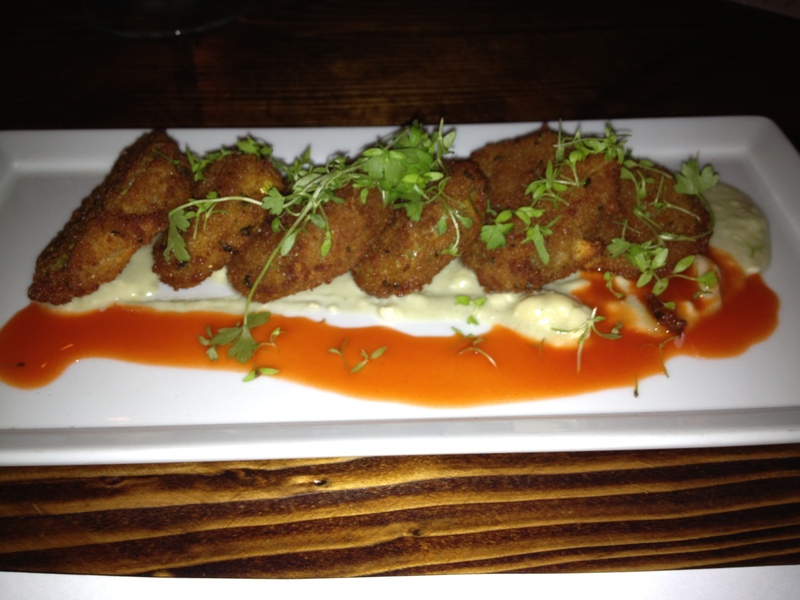 The Buffalo pickles with gorgonzola and hot sauce are not to be missed. The fried sour pickles rest atop cheese and a snappy sauce. These first bites of food make me sit up and declare “oh yes” I know this meal is going to be good. I am going to confess something that perhaps I should not. I am hoping not to be judged harshly for it. 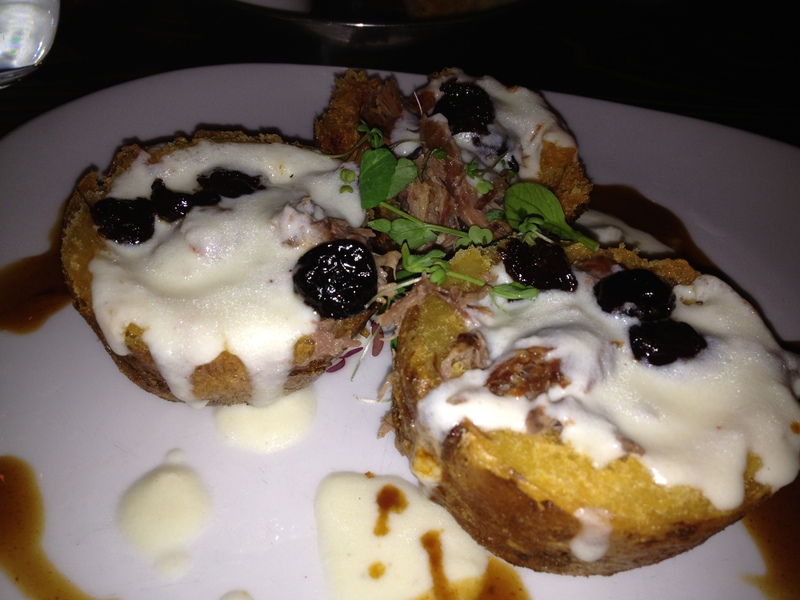 I order a “small” plate of duck confit potato skins with brie mornay and au poivre cherries. I ask our server if the portion is large and she smiles and tells me that there are three good-sized potato skins. This does not make me happy. No one in my party is able to share this with me, because they don’t eat meat and/or milk and meat. I order it anyway. It’s appeal is irresistible. I am simultaneously embarrassed by my gluttony and ecstatic at the realization that my suspicion of greatness is not wrong. The crispy skins are filled with shredded slices of duck, creamy mild Brie, and delicious sweet cherries. I eat just one (at this meal). This dish alone may be the reason that I am now forced to take drastic steps towards weight reduction. Does it help to say that I didn’t eat the bread, even though I am told it is delicious? ….I didn’t think so. I suppose that I could stop here and not order from the “large” portion of the menu. But then I would have deprived myself of the marvelous Lamb Meatabally’s Kebob with mint salsa, Israeli couscous, and squash chow chow. This would have been a tragic loss, as the depth of flavors and fresh ingredients in this dish are as destination-worthy as the potato skins. 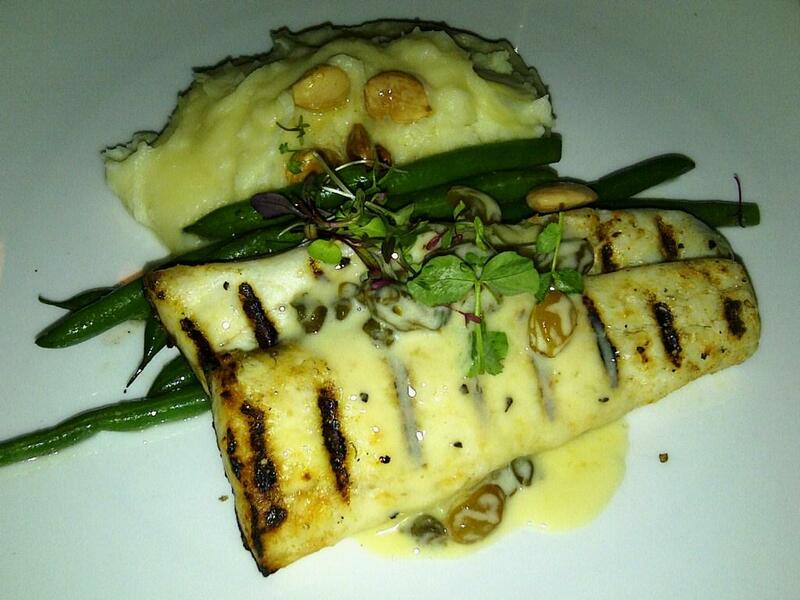 My husband has grilled bronzini with whipped potatoes, almond green beans, and lemon caper raisin butter. The fish is extremely fresh- which is a good thing. The purveyor happens to be sitting next to us- an Israeli who goes by the name Tony (not his real name but he thinks it’s more appropriate for a seafood vendor). 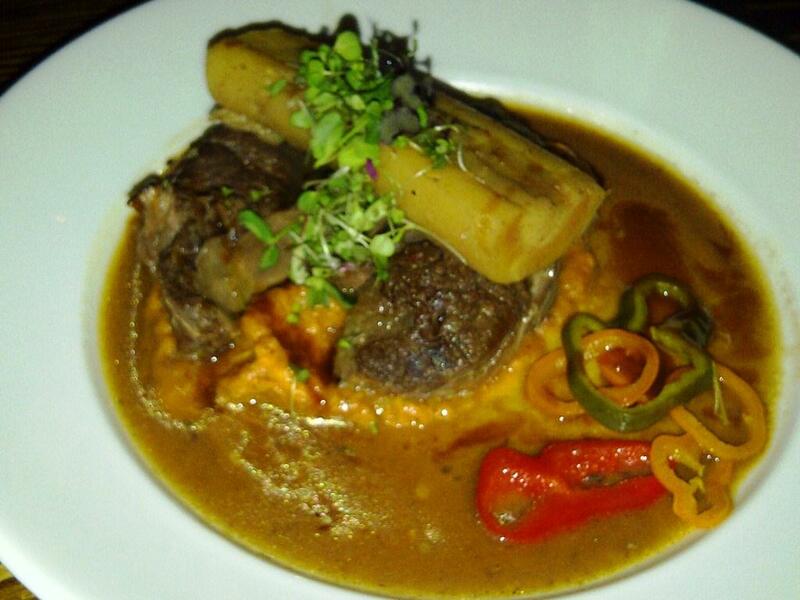 The local bison pot roast with ancho sweet potatoes, pickled peppers, and parsnip au jus is a hearty dish accented competently by both sweet and sour accompaniments. 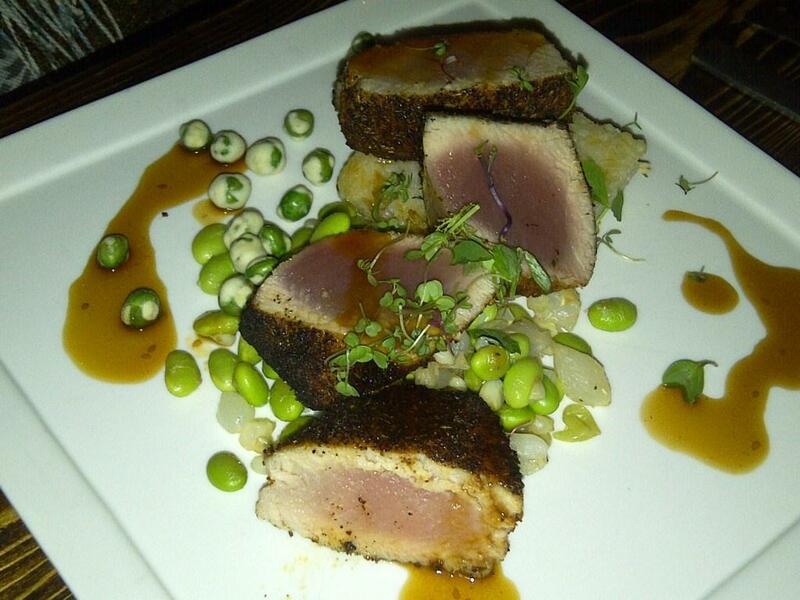 Also notable is blackened tuna with succotash, soy caramel, toasted rice, and wasabi peas. Desserts certainly aren’t necessary but why worry about calories at this point? 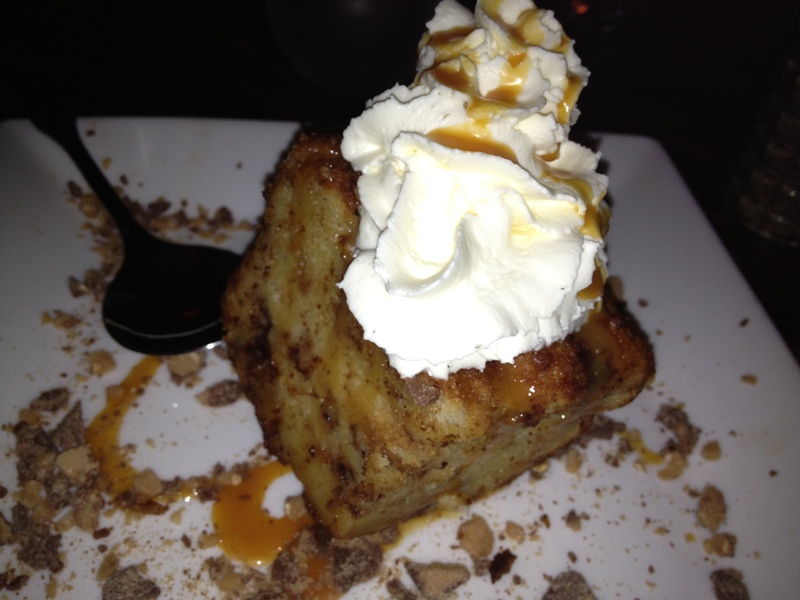 I’ve read great things about the Heathbar bread pudding, and this is confirmed by my friends. 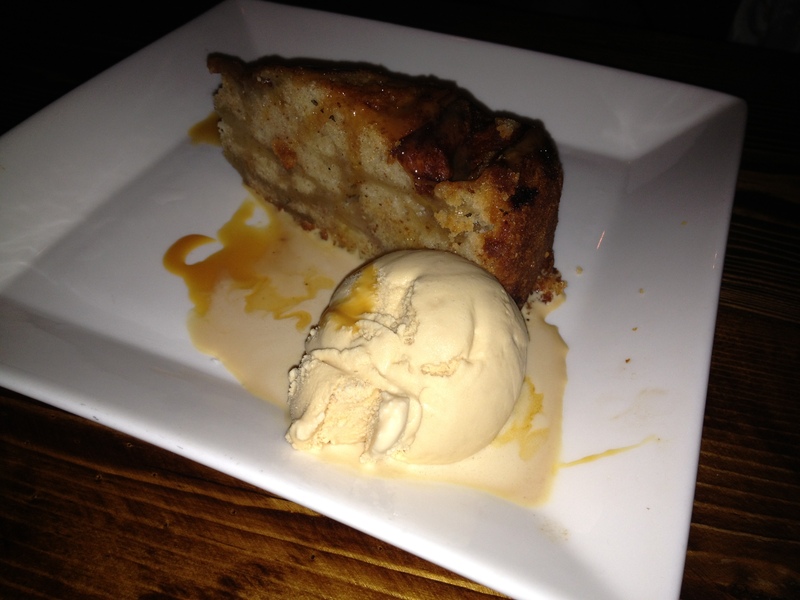 We also decide to share Grandma Steve’s apple cake with salty caramel ice cream. The bread pudding is a bit dry and nothing special. My friends remark that they’ve had a different version of the dessert here that is superior to what we are served. The apple cake is not but, although a little heavy on cinnamon. I’ve had better versions during the recent Jewish high holiday season, when apple cake makes frequent appearances. The salted caramel ice cream hits the spot. It seems to be an off night for desserts. I would give desserts here another chance on a future visit. In terms of the noise level, the investment in acoustical tiles have helped. It’s now on par with any loud and bustling restaurant. This is a good thing, as the customer base on a Saturday night at least, covers a wide spectrum in terms in terms of age. Unbearably loud is never a good thing with older diners, no matter how delicious the food. My next trip to The Food Market in Hampden will be for brunch, so that I can take another turn at exploring the neighborhood offerings. 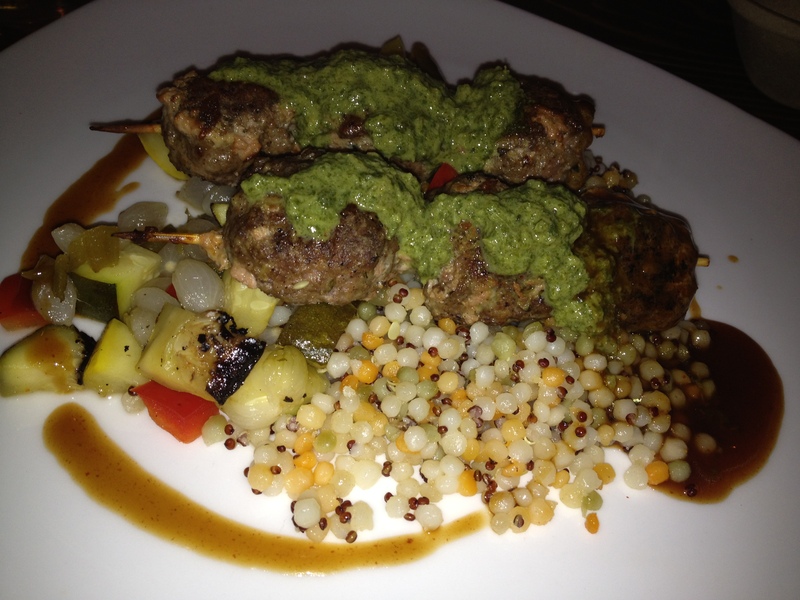 I will definitely be back soon, because in my opinion the food is simply … Divine.